Hearing aids are a medical device with technology designed to improve the hearing of Individuals with a wide range of hearing losses. Most of today's hearing aids are digital. Digital technology provides for greater clarity and more accurate sound reproduction. It is also easier to miniaturize digital technology compared with the older analog technology. With the improvement of digital technology have come many new features, including the ability for the hearing aid to differentiate between speech and all other sounds. This is important because it gives the users of this hearing aid technology the ability to clearly understand speech in noisy and difficult listening environments. Digital hearing aids continue to get smaller and with every new generation of hearing aid technology more capabilities and features are added. The size or style ranges from the Invisible In the Canal (IIC) to the Behind The Ear (BTE). There are several styles between the IIC and BTE. One of the most popular styles is the Receiver In the Canal (RIC). Hearing aid styles can most often be divided into two categories, custom and non-custom. Custom hearing aids are made for an individual's ear canals. This is accomplished by the hearing professional making an impression of the ear canal before the hearing aid is constructed. Custom hearing aids fall into these common styles: Invisible In the Canal (IIC), Completely In the Canal (CIC), In the Canal (ITC) and In the Ear (ITE). Non-custom hearing aids generally fall into two styles the Behind the Ear (BTE) and the Receiver In the Canal (RIC). The IIC is the smallest of the custom made hearing aids. The IIC is invisible for all practical purposes. In general they come with a dark faceplate and fit inside the ear canal so they are not visible in normal day-to-day situations. Generally to achieve their small size some capabilities or features may not be available. The Invisible in the Canal holds a size 10 battery and treats mild to moderate hearing loss. You would choose this type of instrument if you have a mild to moderate hearing loss and want something that sits in your ear canal discreetly. Examples of the Invisible In the Canal are the Siemens Insio and Phonak Vitro Q-nano. The CIC is a custom made device, nearly invisible and fits comparatively deeply into the ear canal. The CIC holds a size 10 zinc air battery. A CIC may not be appropriate for those with a moderate or severe hearing loss as it does not provide enough amplification or cannot provide specific technologies. People with dexterity problems or other medical issues may not be good candidates for CIC's. An example of a CIC is the Rexton Finesse. The ITE is the next size of hearing instrument that is custom made and fits comfortably to fill the entire outer portion of the ear. The In the Ear generally holds a size 13 zinc air battery; larger than a size 312. The ITE is popular with those who need stronger amplification or they want an instrument that is easier to handle with longer battery life. an example of an ITE is the Rexton Accord. The BTE / Open Fit style of hearing aid contains all of the electronic components in the case that is worn behind the ear. These instruments hold a size 312 or 13 zinc air battery. Even though it contains all of the electronic components within the case the Behind The Ear style of hearing aid has gotten smaller in the last decade because of the reduced size of the circuitry. 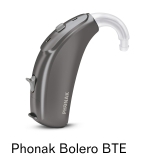 BTE's are capable of providing the most capacity or power in a hearing instrument. This increased capacity or "superpower" feature allows individuals with severe to profound hearing loss to benefit from a hearing aid. For a severe to profound hearing loss the BTE style hearing aid is usually worn with a custom ear mold. Some manufacturers have instruments that have an IP67 rating, so they are water resistant, dust, dirt and grit resistant. The only fully waterproof hearing aid is available in the BTE style. This is an IP 68 rating which indicates a completely waterproof hearing aid that can be immersed in water indefinitely. 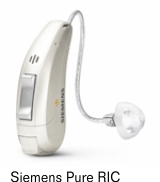 An IP 68 rated hearing aid is available from Siemens it is the Aquaris. Rechargeability is also a feature offered on some BTE models. The tubing on an Open Fit style of BTE is very slim, virtually undetectable. The Open-Fit style uses a soft, vented, pliable material that is not custom made. These ear domes are available in several different sizes and styles. Improvements in technology and the slim tube make BTE's very discreet. 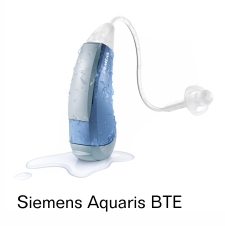 Examples of the BTE style are the Phonak Bolero V-SP " Superpower" and the Siemens Aquaris waterproof. The Receiver In the Canal (RIC) hearing aid is the newest version of the BTE and it is also currently the most popular hearing aid style. The RIC hearing aid style takes the receiver components and places them in the ear canal. This reduces the size of the case worn behind the ear. This style of hearing aid is very discreet because they contain the receiver wire in the slim tubing that connects the hearing aid case to the receiver in the ear canal. RIC instruments can be worn as an open fit by attaching a small ear dome on the end of the receiver. With this design manufacturers are able to change the power or capacity of the hearing aid by changing the external receiver. The RIC is the only design that allows the receiver to be changed without altering the hearing aid case or the circuitry in the case Rechargeability is now an option. They can be charged in as little as 5 1/2 hours and provide all day and all evening functionality. The Open Fit and the RIC instruments have addressed the two most common objections with a custom hearing aid; the feeling of something sitting in the ear and the amplified sound of the user's voice. The RIC and Open Fit style are so comfortable many patients forget they are wearing hearing aids. Hearing Aids vs Listening Devices - Hearing aids are a medical device designed to treat hearing loss. The United States Food and Drug Administration regulate and approve hearing aids. We only offer name-brand hearing aids that are regulated and approved by the FDA. You have probably seen advertisements for low-cost devices in the range of $29.00 to $499.00. These devices are generally listed as a "personal sound system" or "listening device" or other creative descriptions that do not mention the words hearing aid. The advertisements often lead you to believe that these devices could be used by someone with a hearing loss, this is not true. The FDA categorizes these devices as sound amplifiers. Sound amplifiers and are not intended for the treatment of hearing loss. Sound amplifiers are for recreational use by individuals with normal hearing. Click on this link for more information from the FDA about hearing aids and sound amplifiers.